Of the many restaurant awards handed out in Chicago, only one represents the heartfelt opinions of a broad base of ordinary food enthusiasts spending their own money on the food they truly love. That's the LTHForum Great Neighborhood Restaurant designation, nominated and selected by the members of the popular Chicago-based culinary chat site. Its members run the gamut from four-star chefs to hot dog stand proprietors, lawyers, writers, musicians, college students and everything in between, all united by a love of food-- and a willingness to share their finds on the internet. LTHForum is pleased to announce that 46 restaurants last awarded the Great Neighborhood Restaurant designation in 2007 have been recertified for the award, following a lengthy period of trial, discussion and careful evaluation-- to make sure the places chosen still have their magic that captivated LTHForum posters in the first place. Each restaurant will receive a certificate similar to the one shown above, highlighting some of what makes it special-- and in many cases, recommending specific dishes to try. Chicago is a city of great neighborhoods, made distinctive by history, ethnic mix, and vibrant street life and culture. The Great Neighborhood Restaurant awards honor restaurants all over the Chicagoland area which contribute to their neighborhoods’ and the city’s character by offering outstanding food, an authentic experience of their ethnic culture, and/or a welcoming (or in some cases, belovedly cranky) atmosphere for guests. Many of these are not merely great places to eat but true cross-cultural meeting places, where power brokers and city workers, cops and perps can bump elbows or trays while enjoying honest, handmade food. Restaurants are nominated by registered members of LTHForum.com, the Chicago-based culinary chat site, and ratified by a committee of board members, based on the degree of discussion and community-wide enthusiasm evidenced on the site. For the renewal process, this meant that each restaurant must either have had ongoing favorable discussion since it last earned the designation in 2007, or members had to try it again and report back to ensure that the restaurant had retained its previous level of quality and distinction. Click on each restaurant’s name to read the nominating thread for more details. 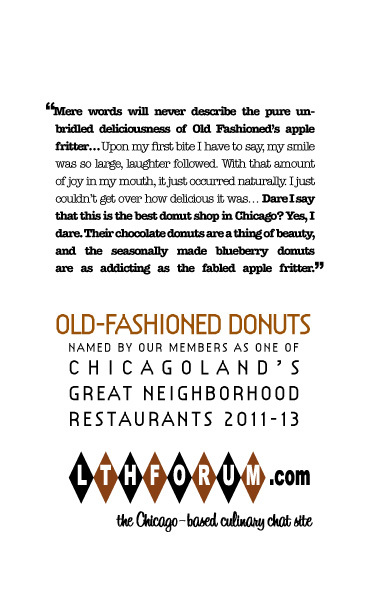 Go here for a handy pocket guide to all 106 current LTHForum Great Neighborhood Restaurants. Al’s No. 1 Italian Beef (Taylor Street location)-- Taylor Street stand serving classic Chicago Italian beef and charcoal-grilled sausage. The designation only applies to this location. Amanecer Tapatio-- Mom has retired to Mexico, but the next generation is still putting out great regional Mexican food in Joliet. La Casa de Isaac-- A splash of Mexican sun and soul on the Highland Park/Highwood restaurant row, though don't go Friday nights-- though not strict kosher, the restaurant-veteran brothers who own it keep the Jewish sabbath. Coalfire-- A genuine coal-fired oven is responsible for the tasty char on Italian and New Haven-style thin crust pizzas at this Grand Avenue hot spot. Fabulous Noodles-- Top-quality & authentic Chinese in a Lisle mini-mall. Healthy Food-- Believed to be the oldest surviving Lithuanian restaurant our neck of the woods, maybe the world, a charming slice of old ethnic Chicago serving up beyond-hearty food in Bridgeport. Lao Sze Chuan (Chinatown and Downers Grove locations)-- Chinatown Mall restaurant (and suburban sibling) serving seemingly endless menu of Western Chinese specialties. La Oaxaqueña -- Pair of fine family Mexican restaurants on north Milwaukee and west Diversey, serving outstanding freshly-made versions of classics like chicken mole. Riviera Foods-- West side Italian deli offering outstanding housemade sausages and sandwiches, including the “Will Special” (named for LTHForum member “YourPalWill”). Schwa--Downscale and very creative fine dining blending skillfully into its neighborhood, genuine and personal. Vie-- A Blackbird-alum chef with a strong commitment to regional and seasonal flavors brings a downtown foodie outlook to suburban Western Springs, along with a very family-friendly attitude. Many thanks to the GNR Committe for all their excellent work, particularly, but in no particular order, Ramon, MHays, SteveZ, Santander, Suburban Ronnie and G Wiv. Also thanks to David Hammond, Germuska and Cathy2 for their support and invaluable assistance, and of course to all of you for eating, critiquing, posting and caring. It is a great list, and it is your list.